Are you struggling with your weight loss? 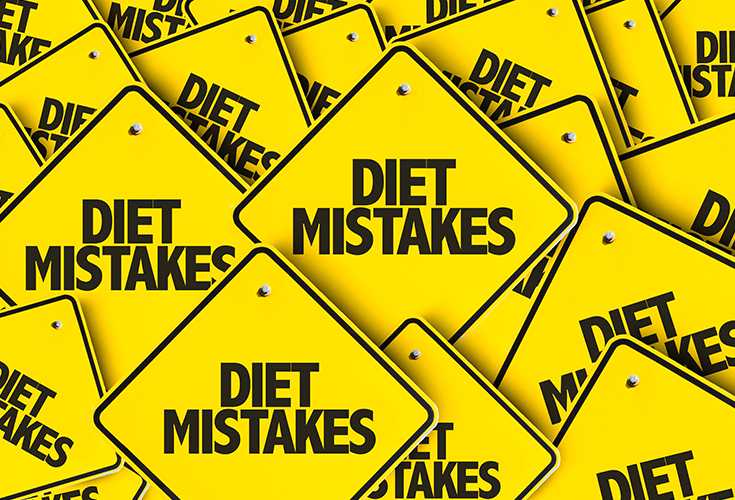 We’ve put together a list of common mistakes women MUST AVOID that sabotage losing weight. Weight loss tips you can start using right now! So, you’re hitting the gym regularly and eating more healthy than ever, but you still can’t see any change on the scale? It’s super frustrating, I know! But don’t worry, it’s likely that you’re sabotaging the fit and toned figure you dreams because these lifestyle habits. Just a single glass of soda or other sweetened beverage can contribute to weight gain, especially in the abdominal area. Drink water infused with fresh fruit, herbs, and vegetables, instead of drinking juice or soda for breakfast or when you feel thirsty. Eating with a fork means you’re eating a lot quicker than you would with chopsticks. Eating slowly promotes consuming fewer calories. No chopsticks? No problem! You just try and hold the fork with your non-dominant hand to produce a similar effect. Cool tip right? Cupcakes are sugar-laden treats that aren’t friends to your abs. A cupcake can pack approximately 20 grams of sugar which contributes to additional stomach fat. Try replacing them with some healthier snacks. Sarah-Jane Bedwell, RD, LDN, shared a secret with us – most of the gluten-free breads have twice the carbs of whole-wheat breads because they are made from refined grains, such as white rice flour. If you need to eat gluten-free bread look for one made with a mixture of whole grains and seeds, like amaranth and millet. Eating mini meals such as two squares of dark chocolate, a handful of almonds or a stack of multigrain crackers is not always the best option for speeding up your metabolism. Lisa Hayim, MS, RD, and founder of The Well Necessities says that although those meals control the appetite, eating more than three times a day can have an impact on your total food intake. So, always make sure that the small meals are light and within the needed caloric intake. Cutting bananas and apples off of your menu is a mistake. The potassium found in them de-bloats the body naturally and their natural sugar acts differently than added sugars. So, don’t say “No, thank you” to apples or bananas anymore. The recommended alcohol consumption for a woman is one glass of 5 ounces a day -definitely not the size of an Olivia Pope’s glass which holds up to 23 oz! A glass of wine has 120 calories and your body burns alcohol calories first to get them out of your system as fast as possible. This means that food calories are put on hold, making it harder for you to lose weight. And, of course, alcohol stimulates your appetite, making you eat more with each sip. Partner Comparison Disorder may not be an official diagnosis, but the struggle is real, especially when it comes to weight loss. Maybe it has happened to you! You and your partner commit yourself to health, wellness and losing weight. Both of you work out and eat healthy for a period of time and then, your partner starts to fall off the bandwagon. You continue your journey and after some time, you realize that he is sleeping in, not working out as much and somehow getting better results! The point is to understand that women will always have a higher percentage of fat than men, despite consuming fewer calories. A healthy range of body fat is 20% to 25% for women, whereas for men it’s 10% to 15% for men. So, remember not to compare yourself to your partner and don’t beat yourself if you aren’t seeing the same results! 9. Are You Cutting Out Egg Yolks? Egg yolks are a great source of vitamin D which is proven to help in preventing abdominal obesity. Also, because of the healthy fat contained in the yolk, you will feel fuller for longer meaning you’re far less likely to overeat later in the day. So, give remember to give the yolks some love! Even if you choose a healthy meal from the menu, you can’t control which ingredients go into the dish. Of course restaurants and bars want their food to be delicious, so it’s likely that they’re adding extra fats and sugars to the items on the menu. Dr. Taz says that people who prepare meals at home consume fewer calories than those that eat out. Try and make your own meals in the kitchen as much as possible where you know exactly what ingredients are going into each dish. Most women on a diet repeat the same meals over and over. This habit lovers your metabolic rate and prevents probiotic diversity in your stomach. According to Dr. Tasneem Bhatia, MD, also known as Dr. Taz, food diversity challenges the gastrointestinal system by giving new sets of probiotics with each new food, increasing your metabolic rate. Researchers constantly show a strong connection between being overweight and getting low amounts of sleep. The shorter a woman sleeps, the higher her body mass index is likely to be. So, next time instead of binge watching your favorite series on Netflix, brush your teeth and try reading a book in bed. Be sure to get 6 to 8 hours of beauty sleep and you’ll find yourself losing pounds without even changing anything else! Your trainer must have told you to eat something before and after a workout. These words can become so ingrained into your brain that you eat whether you’re hungry or not. But, you may have enough fuel from recent meals and not need more calories, especially if you have had a large meal the day before. If your last meal was more than three hours before your upcoming workout, grab a healthy snack rich in carbohydrates like a banana and you’ll be good to go! The new holiday flavors that Starbucks and other coffee chains offer contain up to 300 calories, and they’re filled with more than a day’s worth of sugar. Next time, go with a lighter version of your favorite coffee flavor or treat yourself once a week. A lot of women are worried about adding too much muscle. There’s nothing to worry about because women naturally have high amounts of estrogen which makes it harder to build muscle, so it’s not possible to become too bulky no matter how much weight you’re lifting! Muscle cells also burn more calories at rest because they need more energy to maintain themselves, compared to fat cells. Adding weight training exercises to your workout routine will increase your muscle-to-fat ratio and you’ll look much more lean and toned. Try these kettlebell exercises that burn up to twice the fat of running! Eating food with monounsaturated fats like fish and nuts is proven to promote losing abdominal fat. Simply put – your waistline won’t be happy without enough healthy fats. You need to get a sufficient amount of Omega-3’s and Omega-6’s in your diet, without them you’ll see far less than optimal results! Even if you’re on a low-calorie diet eating too much sodium promotes belly bloating and water retention. This could be the reason you’re not losing pounds and still looking bloated. Try to eat less processed foods high in salts like pizza, bread and any type of processed snack. Consume more foods lower in sodium or whole foods made with fresh ingredients. Although your body benefits from meat protein, eating a lot of eating can compromise your health and your flat belly. Try and incorporate more plant-based foods into your diet because they offer you lower levels of saturated fat and cholesterol; and provide higher levels of fiber, potassium, magnesium, carbohydrates, and antioxidants. Saving the calories for your late night tacos and margaritas date doesn’t quite work out as well as we’d like. By the time you get there, the feeling of extreme hunger will hit you and you will look for food high in calories. Plus, the alcohol will stop your body metabolizing the calories efficiently and increase your appetite. Instead, consume normal meals before any dates and enjoy your cocktails with light snacks instead of heavier foods. Think coconut milk is the healthiest option? You’re wrong! Although it’s plant-based, it is high in fat and has little to offer in protein. So, you’re better drinking coffee with low-fat milk or just sticking to water. It’s important to understand why you want to make changes in your diet. You need to educate yourself and talk to a doctor before making drastic dietary changes. You can cut out gluten or become a vegan and still gain weight because of the calorie-dense or nutrient-depleted foods you consume. Ever notice that lots of vegetarians are overweight? Not drinking enough water throughout the day can have a negative effect on your metabolism and your appetite. Also, a lack of water in combination with a high fiber diet can result in digestive problems. Take your water bottle to your bed tonight and remember to drink constantly throughout the day. Women who eat beans have shown to have more success in weight loss and have slimmer waistlines than those who don’t. If you’re avoiding them because of the fiber which can cause gas and bloating, you just need to drink more water and you will prevent those issues from occurring. Don’t forget that hormonal cycles can interrupt your flat belly dreams. When you’re on your period you’ll often notice a bloating effect. So, next time you’re close to your period, cut yourself some slack and don’t worry too much about it. You may need to reconsider if you have the habit of drinking a protein shake or smoothie after every workout. For a workout less than an hour it is unnecessary to consume shake or smoothie in between because it only increases caloric consumption, just wait until your next meal. Low vitamin D levels contribute to belly fat. Milk and the sun are excellent sources but don’t forget mushrooms too! They are filled with nutrients and are a great source of vitamin D.
It’s especially important to make sure you get enough Vitamin D during the winter when you are most likely getting less sun light. You can also use supplements to make sure you’re meeting your daily intake requirements. Please note that many of the blender-marketed smoothies and juices are filled to the brim with sugar. Of course companies want their smoothies to taste delicious and have you keep coming back for more! Next time, prepare yourself a homemade healthy smoothie of fresh fruits and vegetables. You’ll know exactly what ingredients are going into your smoothie and you’ll be able to calculate the calories. Probiotics have been proven to lower abdominal obesity and also help with digestive problems. Choose a yogurt with active cultures and have it daily to make sure you have a healthy amount of bacteria in your gut. Next time you go to the farmers’ market don’t just document the pretty stands for your Instagram feed, also grab some of your favorite fruits and vegetables. To meet our nutritional needs we need five or more fruits or vegetables each day. They are excellent for achieving a flat belly since they are rich in nutrients and fiber while being low in calories. The Internet makes it impossible to stay away from cravings. It’s basically a huge part in what is making us fat. Try and google a healthy version of your favorite snacks next time you want to eat them – there will be loads of recipes so there isn’t an excuse for you to eat unhealthily!